Microsoft has this week announced the availability of a new Raspberry Pi online simulator which has been added to the Azure IoT Hub allowing users to learn the basics of working with a Raspberry Pi PC without actually having any hardware in front of them. The online simulator is a great way to prototype Raspberry Pi projects before purchasing the components required to create the project in real life. • Assembly area – The default circuit is that a Pi connects with a BME280 sensor and an LED. The area is locked in preview version so currently you cannot do customization. • Coding area – An online code editor for you to code with Raspberry Pi. The default sample application helps to collect sensor data from BME280 sensor and sends to your Azure IoT Hub. The application is fully compatible with real Pi devices. • Integrated console window – It shows the output of your code. At the top of this window, there are three buttons. ◦ Run – Run the application in the coding area. ◦ Reset – Reset the coding area to the default sample application. ◦ Fold/Expand – On the right side there is a button for you to fold/expand the console window. 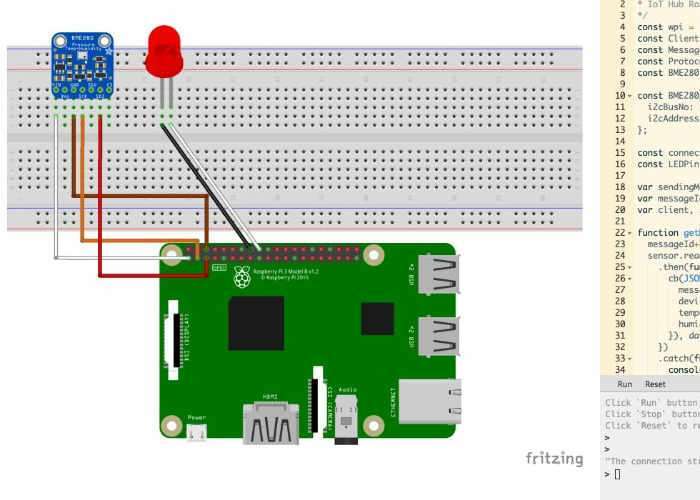 If you are interested in learning more about the Raspberry Pi online simulator to Azure IoT Hub jump over to the official Microsoft Azure site where full instructions have been provided by Microsoft. Together with tutorials to learn the basics of the Raspberry Pi online simulator and create an Internet of Things hub.